Make Your Full Time RV Life the Best It Can Be! Storage space is limited in our RV’s no matter which RV you own. Since space is limited for RVers, each item we put in our RV needs to have a purpose – preferably several. There are a bunch of must-haves for your RV, but the six items below are essentials you may not have thought of yet. We won’t travel without them. 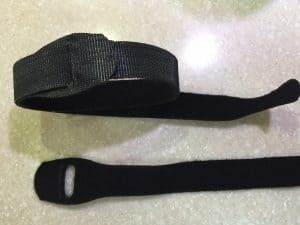 Several of these items are in our RV because of lessons-learned-the-hard-way, and, yes, we’ll share those stories with you. 2. 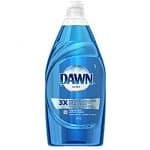 Blue Dawn dish detergent. Two multi-purpose items, for sure! Here’s our number one Solo cup story and it’s the main reason we won’t travel without our cups and blue Dawn dish detergent. We were in North Carolina one fall season and were anxious for fall’s beautiful leaf color change. We parked our RV against a hill filled with trees primed for fall color. The nighttime temperatures were dropping and the days were getting shorter which was good news for fall leaf color. Unfortunately, a different event took place first. The cooler nights brought stink bugs down from the hill looking for winter hiding places. 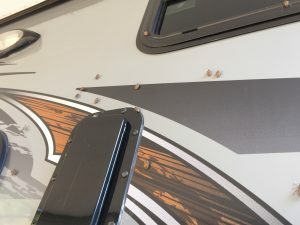 And not just a few stink bugs, but a hoard of them – crawling all over the outside of our RV. 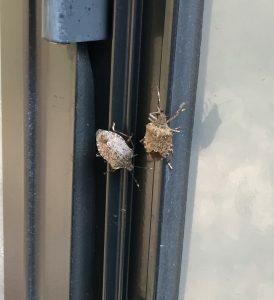 Before we could get past our open-mouthed amazement at the number of stink bugs, they found their way into the toyhauler – especially the garage area. There was just no keeping them out. Each hour brought more bugs landing on the RV and finding entrance holes. It seems when stink bugs find a comfy place to winter-over; they secrete an odor that calls in all their stink bug friends. During our month long eradication process, which included a move to a non-stink bug area so we could get rid of the invasion, our Solo cups and blue Dawn dish detergent were invaluable. Did you know that a stink bug dropped into a mixture of blue Dawn dish detergent and water kills it before it can let loose its stinky chemical? 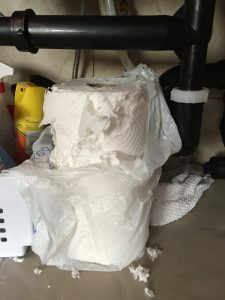 Yes, you need to change out the mixture frequently, because their stink will permeate the soap, but when the alternative is a stinky house, you’re glad to do it. Here’s another tip, stink bugs let go and drop down if they sense something is near them, which means you don’t even have to touch them with your hand to get them into the cup! 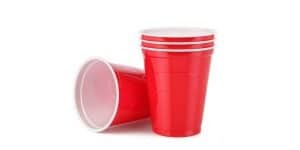 Just hold your Solo cup over them when they’re walking across the ceiling and slide it sideways until the stink bug drops in or if they’re on the wall, hold the cup under them and poke them with something. They’ll drop right in. After researching and talking to others, it seems the annual stink bug attack is pretty common in a number of states so be ready with your Dawn and Solo cups! Or, better yet, before you move to an RV park during the fall, ask them how the stink bugs are that year. They were all honest with us when we called around looking for a place to hunker down away from the bug attack. Or maybe plan your fall travels using the map linked below. The red states are stink bug prone during the fall. The map will help you see how widespread the problem is in the US. Our second Solo cup story involves a bat we acquired in Washington State. The bat apparently was sleeping during the day as bats do and just as we turned out the lights for bedtime, it fluttered past our faces. Sure enough, it was a bat. We dashed around turning lights on and caught a glimpse of it flying in the living room. After a stupid looking chase involving a large beach towel, our bat landed on the AC register and began to shimmy its little bottom through the crack. 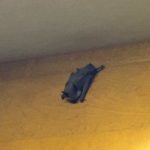 A bat in our AC ductwork was not going to happen! Solo cup to the rescue! The Solo cup gets placed over the bat, the cup is slid back and forth, the bat drops into the cup, my hand goes over the cup, and we release the frightened bat back into the night. Don’t be without your Solo cups! These cups are, of course, useful for mundane things, too, like when neighbors stop by with a blender full of smoothie to share with you. Which did happen once. Special times! And they stack nicely and don’t rattle around when you are on the road. Nice perk! 3. Refrigerator door tie and freezer doorstop. Another must-have for the RV is a way to keep your refrigerator and freezer doors secure while you’re traveling. For you fortunate RVers who have a locking system on your refrigerator and freezer, you’re all set. But we’ve always had residential refrigerators, and they will not stay closed on the road. They’ll fool you because they’ll stay shut a lot of the time, but when they don’t, it’s a mess. We’ve been lucky to have only two incidents. One was when we had no idea all the doors were even opening and closing while we drove around. So we’re pulling the toyhauler, unaware the lock on our bottom freezer drawer was broken, and as new RV owners, we had no idea the refrigerator doors could even pop open. We were oblivious. After all, the doors were always shut when we arrived. What tipped us off to the problem was the day I found a frozen grapefruit. Apparently, the refrigerator doors opened just as the bottom freezer door opened and that perfect synchronization allowed a grapefruit to roll from the refrigerator down into the freezer. That was the only explanation we could come up with when we found the frozen grapefruit. And, sure enough, we checked the freezer door and saw it wouldn’t hold tight when we pulled on it. We devised a prop to hold the freezer shut by putting four dumbbells in front of it. We used a Velcro strap to keep the refrigerator doors closed. We did ask around for a better way to hold the freezer shut but never found one. If you know of a better solution, please share in the comments section. We don’t have a bottom freezer anymore, but I know it’ll help out someone who does. Thanks! Now let me share the time I knew better but just forgot to secure our refrigerator doors. This time it was in our motor coach. Larry was driving it back from the repair shop. I was following in our truck. He turned a sharp corner. A gallon of milk fell from the top shelf and exploded on the floor. Since there was no place to pull off to investigate the noise, he had to just drive on. He drove another few miles back to our RV site with the milk roaming around the floor. 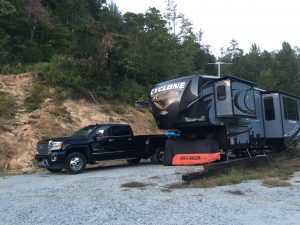 A sense of humor is a must for RVers. My upholstery cleaner has been crazy useful. And not only for the above monumental milk spill clean up. We have the most adorable grandson who loves staying with us in the RV. He hasn’t totally mastered the art of getting all the food in his mouth. On top of the usual kid messes, he likes soup. Haha. Of course, we’d never put our carpet above fun with the grandson, so I pull out the upholstery cleaner and take care of the spills when he leaves. 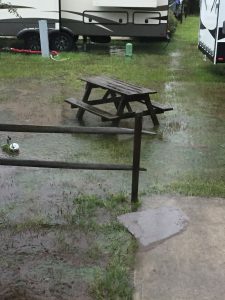 Besides, if you’re camping, you are going to park in muddy, sandy and/or dusty sites all the time. Upholstery cleaners get up a incredible amount of dirt. So get yourself one. It’s worth the storage space. I’m sure after the stink bug and bat stories you don’t want to hear about mice, but it can happen, so have a few mousetraps on hand. You’re going to camp near places that mice live. You have food and shelter. Your RV home has many inviting entry points. Entry opportunities seem to be everywhere in an RV. We even see daylight in the back corner under our bed! I don’t believe there is any reasonably convenient way to keep a mouse out if they decide your place is more cozy and warm than theirs is. The good news is you may never have a mouse join you in the RV. We’ve only had two mice, but we don’t camp in cold weather either (at least not on purpose). Our first mouse was kind enough to sit still while I grabbed his tail and returned him to the woods. I think this was his first rodeo in an RV because he just sat there in the doorway looking all cute for me. Our other mouse, unfortunately, was too elusive to remove by hand and had to be caught in a trap. Peanut butter on a piece of bread is always a winner. If you feel a trap is too cruel, just know you can’t leave a mouse running free in your RV. It will chew everything – wiring, insulation – everything. Which is all very dangerous to your home. They also create bad smells and nasty messes. If you suspect a mouse, it’s best to get rid of it right away. And then decide on some prevention method. Unless you camp where it is always cold, you are going to get ants in the RV eventually. Sugar ants, crazy ants, carpenter ants – there are so many kinds of ants. 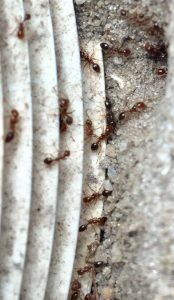 No space is too small for an ant to crawl through, but there are ways you can hinder an ant invasion. Each time you park, you can sprinkle an ant deterrent around your tires and around anything else that’s touching the ground and replenish it after each rain shower and maybe after any high winds, too. You can sprinkle things like Ajax or Comet cleanser or an ant killing powder. Or check into Grants ant stakes. Just be cautious of the harm these things can cause to pets, wild animals, children and the environment. Personally, I don’t bother with sprinkling or staking. Too much trouble and too much potential harm for the slim chance ants will pick our RV to forage in. Another option is putting 100% diatomaceous earth around whatever touches the ground. Again, too much trouble for us. We prefer to take our chances and get rid of them if they arrive, which isn’t often. Even though we’re lazy about prevention, we do make sure no trees touch the roof. No need to give the ants easy access. At least make them climb up the tires and through the underbelly before invading the RV. And we do use ant-killing products in the RV when the ants decide to join us. But, when it comes to getting rid of ants, here’s your very best friend. Moving day is always a special day for me, but it’s especially special if we’ve been battling ants because we know they’ll soon disappear. If you take ants away from their nest, they either lose their need to forage and wander off or die or disappear for some reason. We don’t know the reason, but moving takes care of the problem for us. We hope these suggestions were helpful to you or that you at least got a chuckle from our run-ins with nature and the crazy things that happen on the road. We’d enjoy hearing your crazy stories, too. If you’re an RVer, you have crazy stories to tell! Please share them with us in the comments. Haha! Great stories! Glad you can laugh about them now 😁 I’ve also had the misfortune of dealing with ants mice and a bat, but as far as I know, we don’t have stink bugs in Canada. Great tips, I’ll be sure to pack those essentials for this year’s trip – we just booked last week- so excited! I’m excited for you, too! There’s nothing like heading out on a new adventure. Although we’ve had great fun with family and friends around Florida this winter, I’m ready to head out. This summer we plan to explore around Lake Michigan and Lake Superior. Hopefully, we can pop over the Canadian border for a short visit, too. Happy camping!